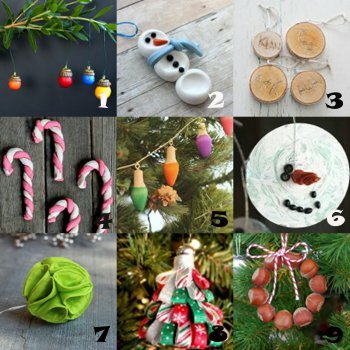 55+ New DIY Ornaments: Vote for Your Favorite! Happy ornaments! 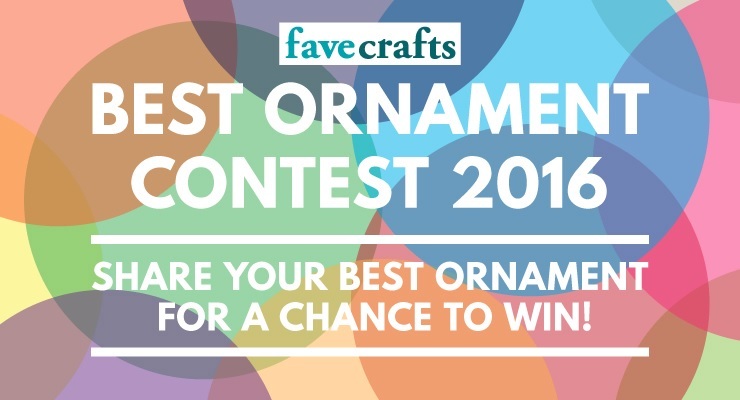 Submissions for our Best Ornament Contest 2016 have closed and voting has begun. We received over 55 awesome DIY ornament tutorials ranging everywhere from paper crafting to recycled craft ideas and more. Check out all of the awesome entries here. We’re doing voting a little differently this year! Historically, we set up voting pages where fans of FaveCrafts could click a vote button to select his or her favorite projects. This year, we’re judging the contest based on . . . page views! That’s right: the more people that click on your project, the better! As people scroll through the entries and click on their favorite projects, those clicks count as votes toward those ornaments. It truly is a popularity contest in that sense! The top ten ornaments will also appear in an exclusive Best Ornaments 2016 free eBook, which will be available for download on FaveCrafts.com. 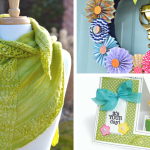 Crafts featured in the eBook will include a direct link to the blogger’s website. Click on your favorite projects. That’s it! We’re so excited for this contest and we hope you are too. I love the holiday season for a lot of reasons. The sights, the smells, the goodwill – this is simply the most magical time of the year. However, there is one thing that I love the most during this time of year – the decorations. 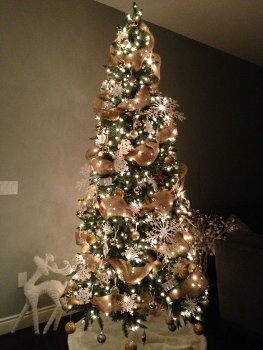 Specifically, I love seeing how different families and individuals choose to dress up their trees. 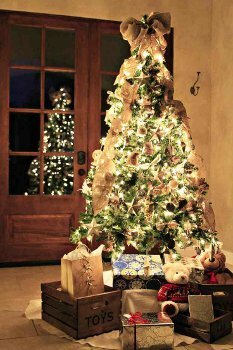 Since I don’t decorate my own tree, I love to admire other people’s hard work. 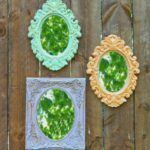 FaveCrafts features a variety of fun ornament crafts, but it seems that the quick and easy projects are always the most popular. 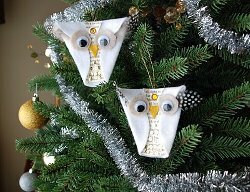 These are the ornaments you make in an afternoon or even in a few minutes. These ornaments are also kid-friendly, so you can work on the projects as a family and use this time to teach valuable lessons about the holiday season. 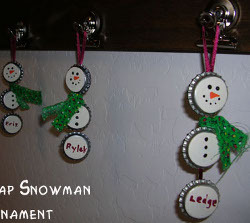 If you want to include the kids in your Christmas crafting fun, look no further than the Easy Icicles Ornament. 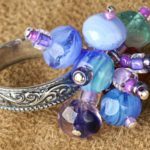 Use beads, sequins and pipe cleaners for this simple project – it’s perfect for elementary-aged children. Similarly, the Reindeer Ornament doesn’t require any expensive material or hard-to-use supplies, but the finished product is too cute to miss. 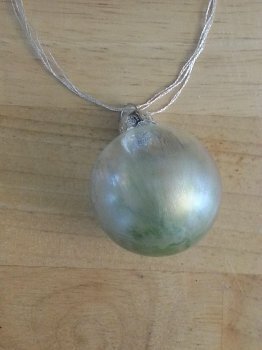 If you are looking for a more adult-friendly craft project but simply don’t have a lot of time to get creative, a Cute Santa Hat Ornament or a Glitter Filled Ornament will get you in the holiday spirit. Ornaments are the perfect craft for the holiday season – you can hang them on your own tree or give them to someone you love. 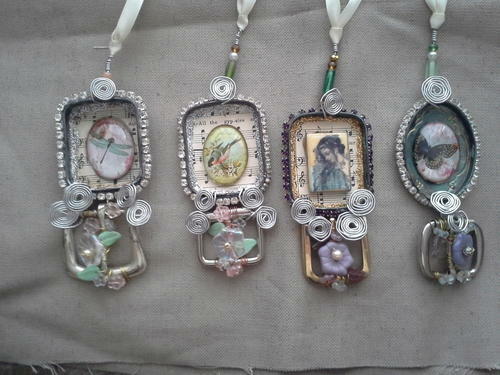 No matter what, the piece you create is sure to become an heirloom that will be displayed each year. Gather up the family and get to work – Christmas will be over before you know it! 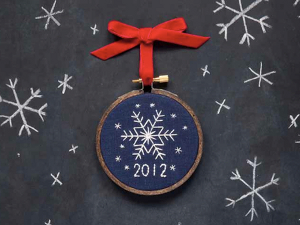 Which ornament on your tree is the most meaningful and why? This post is brought to you by Shahab Shokouhi. If you want to foster a spirit of festive family time this holiday season, there’s no easier way than getting the kids involved in the holiday decorating. And even if the weather outside is frightful, there are ways to work the outdoors into your indoor decorating scheme! 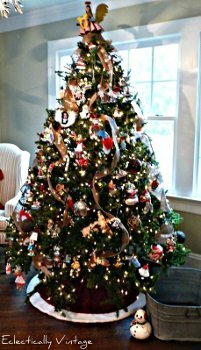 So before you start decorating the tree, rather than simply letting the kids hang the ornaments, why not let them make the ornaments? 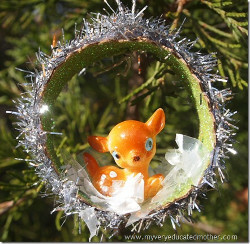 Here are four different outdoor-themed ways to dress up your glass ornaments that are kid-friendly and parent-approved. 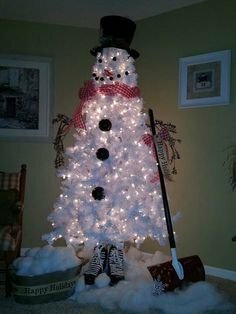 Whether you live in a warm climate or in a subzero setting, who doesn’t love a snowman? 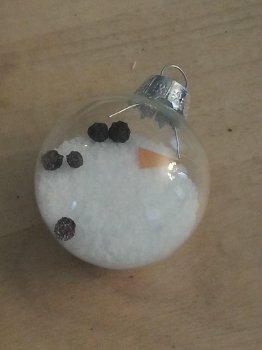 This little snow globe encompasses a melted snowman after he’s served his purposes out in the yard and can be yours with a few household materials! Remove the cap from the ornament and use the funnel to pour the salt into the glass, about halfway to the top. 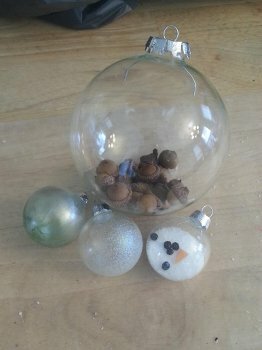 Drop in 5 peppercorns and a little carrot nose before replacing the top and threading the ornament with a ribbon or twine. Send the kids outside to gather acorns or small nuts or seeds. 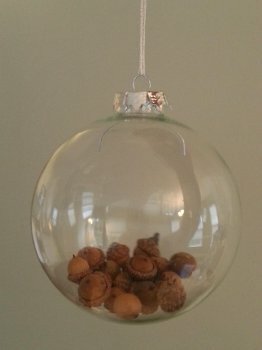 Make sure you have a glass ornament with a large enough mouth for the acorns to fit through. Remove the cap, drop in the acorns, replace the cap and thread through the opening with the ribbon or twine of your choice. 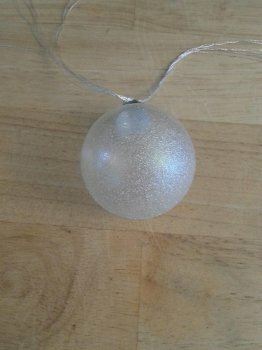 Grab a can of glitter or ‘snow’ spray paint and turn the ornament upside down before coating the entire underside with a layer of the spray paint. 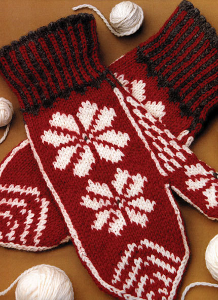 Coat it evenly but make sure not to spray so thoroughly that you can’t see any of the glass ornament underneath! Allow it to dry for at least 2 hours before handling. 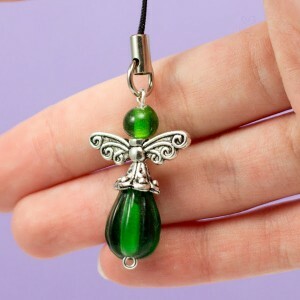 This one is best saved for older kids who can handle glass with gentle fingers. Grab a couple of colors of metallic craft paint (this one uses a base coat of silver and top coat of green to represent the evergreen outdoors!) and turn the ornament upside down. Carefully apply a light coat of one color, allow it to dry for at least 2 hours and then apply a top coat of another color. Notice how the strokes of paint are light-handed and do not cover the entire glass ornament. 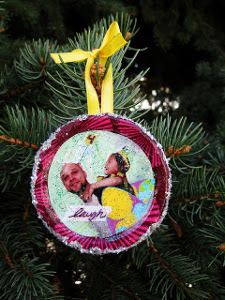 What are some of the creative ways you and your kids have decorated the inside and outside of glass ornaments? Mason jars are not just for canning anymore! There are so many fun uses for these versatile containers. Really, is there anything you can’t use mason jars for these days? Surely you have seen them around. People use them as luminaries, candles, vases, and even lamps for weddings or home decor. 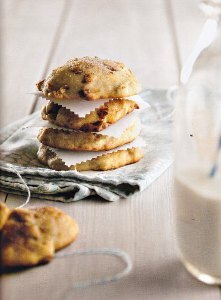 They can also be used as gift containers, particularly for soup and hot chocolate mixes. Christmas is a great time to try out crafting with mason jars. 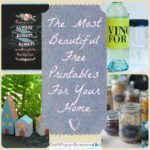 We here at AllFreeChristmasCrafts love mason jar crafts, and we hope you will too. We have some great DIY holiday crafts for you to try out this Christmas. From candles to gifts to holiday decorations, these jars have so many uses, especially around the holiday season. This list of 11 mason jar crafts for Christmas is sure to meet your crafting needs! Choosing mason jars as gift containers is one of the best ways to use these versatile containers during the Christmas season. 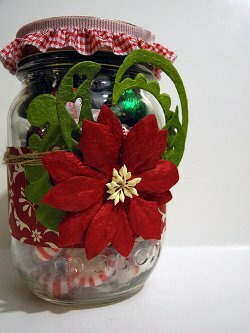 You can focus on decorating the jar itself using examples like a Decorated Mason Jar Teacher Idea or this Gorgeous Poinsettia Christmas Jar, and then fill the jar with candy or chocolates. 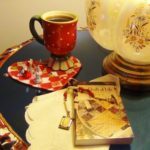 You can also pay special attention to the contents of the jar and create a thoughtful, easy gift like a “We Love You” Jar that is filled with little slips of paper describing the reasons you care about the person you are giving the gift to. Either way, decorated DIY mason jars make simple, but classy gifts. While many mason jar crafts make great gifts, you can also use these jars to add to your collection of homemade holiday decorations. Make ornaments out of the jars themselves like this Mason Jar Greenery Ornament, and with just a couple leafy additions, you’ll have some beautiful pieces to add to your tree. Remember, you can also use the mason jar lids in your crafting. Check out these cute Mason Jar Lid Ornaments for an adorable way to incorporate all parts of the mason jar into your crafting. 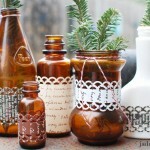 Aside from ornaments, mason jars can be used in many other parts of your collection of holiday decorations. You can go the sensible route and choose a practical craft like Mason Jar Snow Globe Soap Dispensers. A more classic way to use mason jars is to make them into candle holders or luminaries. Use mod podge to make beautiful winter mantel decor, like Snowflake Jar Votive Holders, or fun, festive holiday clear jars, like Junkmail Snowflake Luminaries. Need more sparkle? 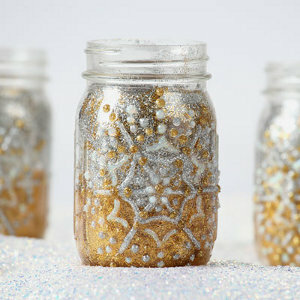 Then these Light Up The Night Glitter Mason Jars are definitely for you. 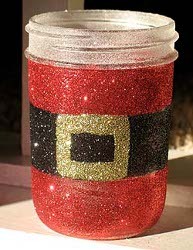 You even make the jars themselves into decorations like this Glittery Santa’s Belly Jar. Add some sparkle and shine to your home this holiday season with these homemade Christmas decorations. 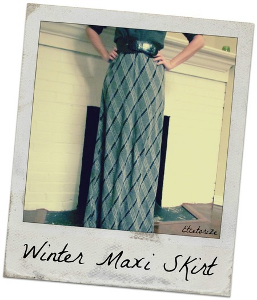 There are certainly a lot of ways to use mason jars, especially around the holidays. We hope you have found the mason jar craft for you this Christmas season! Still want more jar craft ideas? 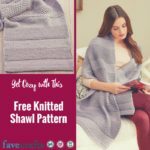 AllFreeChristmasCrafts has a list for you! Here are 16 Jar Craft Projects for Christmas Jars Year Round. 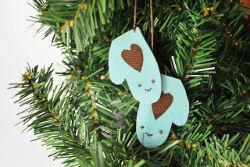 You’ll Love Insanely Cute Homemade Christmas Ornaments! 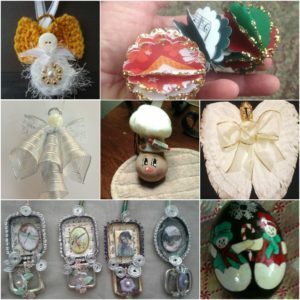 Christmas ornaments are some of the most popular Christmas craft ideas, and why wouldn’t they be? 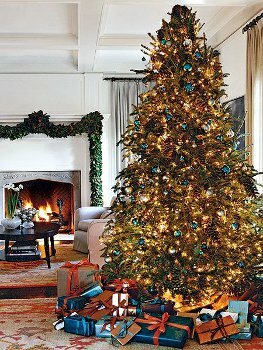 After all, they’re small projects that are easily integrated into anyone’s Christmas decorating, year after year. You can make homemade Christmas ornaments super simply and super quickly, like this Pom Pom Ball Ornament. 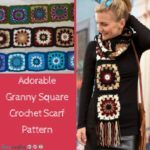 You’re able to take a little longer to make your ornaments with any of these nifty crochet ornaments. 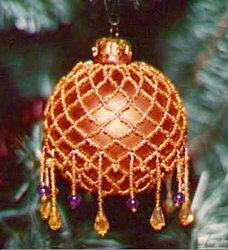 If you’re feeling ambitious and you have a lot of time on your hands, try a Somerset Star Ornament or a Cross Stitched Victorian Cone Ornament. 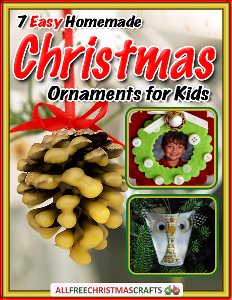 Whatever the age, skill level, or the amount of time you have, you can definitely find an ornament craft suited to your tastes. I have a personal preference for anything that’s insanely cute. Baby animals? Yes. Precious smiley faces? Absolutely. Anything in miniature? You bet. 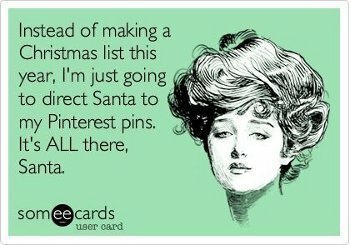 That’s why I’ve put together a collection of Insanely Cute Homemade Christmas Ornaments! 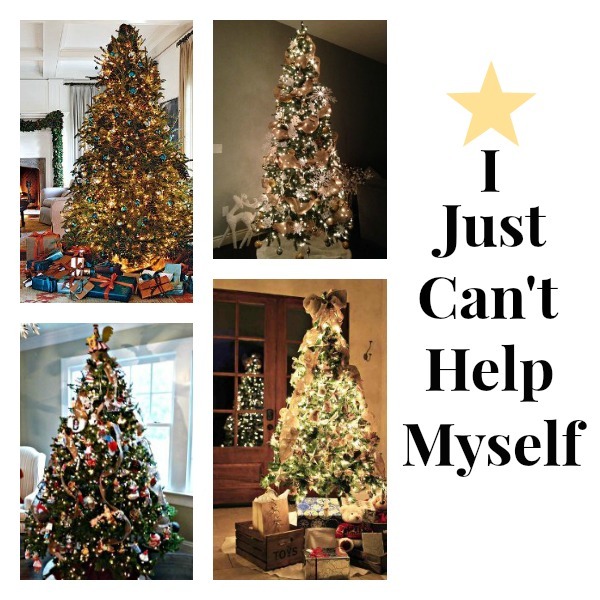 Organized by the different Christmas icons, this collection is a comprehensive grouping of utterly adorable ornaments from across the Christmas spectrum. You have never seen Santa look better than this. 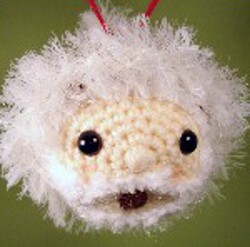 You can make an adorable Santa’s Belly Bell Ornament, or crochet Santa’s face instead. My colleague laughingly likened this “Santa Baby” Crochet Christmas Ornament to Doc Brown from Back to the Future, and who’s more precious than Doc Brown? Well, maybe a few other people, but I digress. Snowmen are a classic icon for the Christmas holiday, and with a little bit of maneuvering, you can make a snowman craft that’s totally cute. Grab jars, fabric, pom poms and more in order to make any or all of these cute crafts. Any craft that’s shaped like food is automatically adorable. 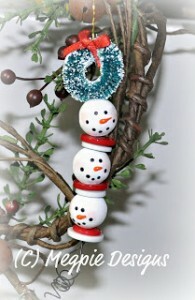 These ornaments look good enough to eat, but they’re only for hanging! Santa can’t get anywhere without his reindeer, and these reindeer will melt your heart. 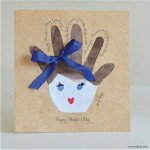 Most of these crafts are super inexpensive. Who knew such cuteness could emerge from recycled materials or dollar store purchases like this Vintage Vignette Ornament? Holy crafts are the perfect way to remind us of the reason for the season, and these adorable ornaments are the perfect holy crafts! What is the most insanely cute craft you’ve ever seen?